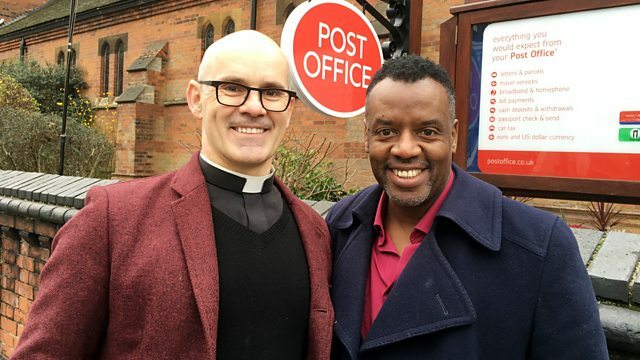 David Grant visits the Post Office church and the congregation in a tent to see how the Church of England is coming up with creative ideas to encourage new members. Browse content similar to 21/02/2016. Check below for episodes and series from the same categories and more! for the first time. Some churches are being forced to close. Many lie empty and others are sold and often turned into flats. So what's being done? Well, there is some good news. to keep their church at the heart of the community. And no, you're not seeing things - the church IS a Post Office. who are firefighting for Christ. I don't need to be in a church to serve. We can all serve our communities in whatever place we're at. taking worship music to the next level. And where the pastors seem to want to steal our jobs! Welcome to Songs Of Praise this morning! including a performance from one of Scotland's finest - Barbara Dickson. something up, here's a hymn of encouragement. and the one thing you'll find is a church. They're an important part of our heritage. The Church of England has 16,000 of them around the country. they may not want to pay for its upkeep. I've come to St James's Church in London. with early-morning prayers for parishioners. the Reverend Andrew Foreshew-Cain - came up with a plan. Is this a church or is it a Post Office? It's a church, a Post Office and it's a whole lot more. Come on inside and I'll show you. -It's like it's a Post Office and so much more! How do you get a Post Office in a church? We had a tweet in 2014 from the local estate agent. "I haven't got a shop front, but I've got a really big church." And that's not the only thing you've got here. Oh, no, we have all kinds of things in here now. We have a cafe and we employ a bunch of people there as well. -And the big play centre. to do with their kids and it seemed a perfect marriage. We get 3,500 people a week through the building. a place of worship and quiet contemplation? but they can also be places of life and enthusiasm and engagement. -And that's what this place is. -..the services that are happening here. So how do you maintain it as a place of faith? separate out all of this from the worship space. so God is watching over everything that we do here. who come in here - that all of life is important to God. of quiet contemplation and prayer and worship. And the congregation appreciate that. When Andrew came up with this idea, I thought he was mad. Just look, I mean, it's absolutely amazing. It's become a social hub for the neighbourhood. The play area, personally, I don't like it. But I do understand its purpose as well. sort of secular activities, like going to the Post Office. The church is about family and community. That's exactly what this is. The congregation has doubled, which is nice. It was from a very low ground. We're about 40-50 people on a Sunday now. which we didn't get before. -I'm sure that's exactly the reason why they're coming to us. and they know is welcoming. it's often accompanied by a church organ. of course, has a role to play in the story of Christian music. churches up and down the country that are busy writing a new chapter. Not the most recognisable part of the city, I'll grant you that. -it's about what you can hear. And this is no ordinary warehouse. It feels like you've walked into a rock concert. But it's Sunday morning and it's 10am! And this is the Audacious Church! # ..for Jesus! We are, we are, we are fearless! from 90 to well over 3,000 members in just eight years. Good morning, welcome to church. all the traditional elements, including a sermon. -And the man has a plan! But it's the very contemporary sound of the music that stands out. The Bible talks about having shouts of joy, um, clapping hands, dancing. And so, there is a real element of celebration in the Bible. how can you keep quiet? We really feel like that's the case. We can't be quiet, we can't shut up and God is so great! off their feet! Front to back, one, two, three, go! -what was your first impression of it? When we first came, the music was a bit of a culture shock. But you just sort of go with the flow, I suppose, in a way. I mean, as an African, we dance everything, we sing everything! I enjoy it, cos it's something different. It's out of the ordinary. The music's new, the music's fresh. and why I know these guys do as well. but, for the band who write them, the approach is nothing new. Key change, and you get off the stool. and brass bands - that was, you know, the secular music of the time. -their way of getting people into the church. With something familiar, that they could understand and relate to. and a relevant expression of our worship and praise to God. how do you ensure that it is an act of worship and not a performance? We're not coming here just to have own personal time. "Look at me, everyone!" but it's actually, "Look at Jesus!" # We are, we are We are fearless! They may not remember a sermon, even though I thought it was brilliant. What they're going to remember is the songs that they're singing. "We learn our theology through the songs that we sing." Wow! That music would certainly wake you up on a Sunday morning! whilst it may not be quite as loud, it's certainly just as heartfelt. but what about the work-faith balance? each other deal with the difficult situations they are called to face. as Watch Commander Paddy Quinn from Omagh knows only too well. And, according to this, it's two persons reported. -The police had phoned it in. -Michael, you got it covered? it can be traumatic when the call is to attend a serious incident. the biggest loss of life in one incident was the Omagh bomb. in the centre of the market town. and deal with that, it was very traumatic. I'd never witnessed a scene like it. Especially since you knew people. People were asking me to help them. and, as a firefighter, you felt so helpless. cos of respect for the families and nobody needed to know the trauma. but every now and again, it came back to you. Firefighters are encouraged to talk about their experiences. that can provide support is Firefighters for Christ. of one of the founding members to cook up a hearty breakfast. We also have counselling facilities within Firefighters for Christ. finances, or just not dealing with life well. in the sense that there's a lot you can take home with you. What you've seen and what you've had to cope with. not just the watch, but potentially the station altogether. So it's nice to have other guys there that have a faith. where they support a children's home. in their love of God and their praise of God. pay for the new roof on the emergency relief building. and deliver free life-saving equipment. Firefighters throughout the world are firefighters. We have a brotherhood, we have a bond. and save others with these practical techniques of rescue. that we rescue their spiritual lives. 'Firefighters, we serve, because our name says service. 'Whether it be in a really serious situation, such as the Omagh bomb. 'who's burnt her cooking and is in distress and we go and help her. Great to hear the congregation in Bristol there. I Know Him So Well and January, February. Here, singing a song from her latest album, Barbara Dickson. # Frail flesh and die? attending weekly services had fallen to their lowest ever. that cause churches like this to close. St Alban's Acton Green in West London was empty for seven years. to create 100 new congregations in London by 2020. In a church, I've never seen anything like this! Why have you got a tent indoors? a tent means that the congregation can stay warm inside. who are going to follow that leader and start something new. Um, welcome to St Alban's this morning. -Um, how are you all doing? "OK, we're going to encourage people to start coming,"
once those things are happening, then you're up and running. of people in London who we're not connecting with. "those networks and say, 'Let's start a church for them.'" And St Alban's has certainly found those family groups. Well, this church didn't look like it had a future. for the community and to be a church again. very important to keep this as a local community space. for the littler kids to bounce around and have fun. What is it that excited you about coming over here? your own flavour on it, really, take it wherever you want to go. and community that they want to be part of. people's lives, what makes them stay, is Jesus, it's the Gospel. that's why people stay in church. dealing with the future of their steelworks. although styles may change, faith endures. I Will Sing the Wondrous Story, performed by the congregation of St Mark's Church, Maida Vale Let Us Build a House, performed by the congregation of St Mary's Warwick Here I Am to Worship, performed by the congregation of Rauch City Church, Brixton O Jesus, I Have Promised, performed by the congregation of St Alban's Church, Bristol My Song is Love Unknown, performed by Barbara Dickson at St Andrew's Cathedral, Glasgow Faith, Hope and Love, performed at St Alban's Church, Bristol Yesterday, Today and Forever, performed at Salvation Army Sale, Manchester.